Along with And I Love Her and Can't Buy Me Love, Things We Said Today was one of Paul McCartney's main compositions on the A Hard Day's Night album. Things We Said Today was written in May 1964, on board a yacht called Happy Days, during McCartney's holiday in the Virgin Islands with his girlfriend Jane Asher, plus Ringo Starr and his future wife Maureen. I remember writing Things We Said Today in one of the cabins below deck one afternoon on my acoustic guitar. I got away from the main party but it was a bit queasy downstairs; you could smell the oil and the boat was rocking a bit and I'm not the best sailor in the world, so I wrote a little bit of it downstairs and then the rest of it on the back deck where you couldn't smell the engine. I don't know why the engine was on, I suppose we were moving. Musically, the song's mood belies it's sunny origins: it is rooted in A minor, and only strays into a major key for the brief middle section. The similarly melancholy lyrics reflected McCartney's knowledge that his and Asher's lifestyles would increasingly drive them apart – although they stayed together until July 1968, and in December 1967 announced their engagement. It was a slightly nostalgic thing already, a future nostalgia: we'll remember the things we said today, sometime in the future, so the song projects itself into the future and then is nostalgic about the moment we're living in now, which is quite a good trick. It has interesting chords. The Beatles recorded Things We Said Today twice for BBC radio. The first was on 14 July 1964 at London's Broadcasting House, for the Top Gear programme. This version, which was first broadcast two days later, was released in 1994 on the Live At The BBC collection. The second performance took place on 17 July at the BBC Paris Studio, London. It was recorded for the From Us To You programme, which was first broadcast on 3 August. The song briefly became a part of The Beatles' live repertoire following its release. The group played it during their tours of the US and Canada in August and September 1964, although it disappeared shortly afterwards. George Harrison sang harmony vocals on these live versions. The Beatles recorded Things We Said Today on 2 June 1964, at Abbey Road's Studio Two. It took the group just three takes to get right. The first take was a false start, the second was complete, and the third consisted of overdubs of McCartney's second vocal part, John Lennon's piano and Ringo Starr's tambourine. McCartney double tracked his vocals, occasionally providing harmony, but mostly singing in unison with himself. John Lennon's piano part was meant to be omitted from the final mix, but lack of separation between instruments meant that its sound leaked into other microphones during recording. As a result it can be heard on the released version. Things We Said Today was first released on 10 July 1964. 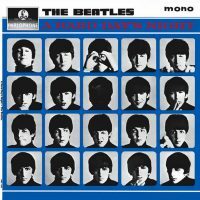 On that day Parlophone issued the A Hard Day's Night album and single in the UK. The song was on the second side of both releases, which were both chart toppers. It was also included on the EP Extracts From The Album A Hard Day's Night, which was released on 6 November 1964. In the US it first appeared on the album Something New, which was released on 20 July 1964. This is one the great early beatle songs. Sadly, it is under apreciated. Sure there is… and this is one. I always loved it but when I’d mention it, nobody knew what song I was talking about. Of course, in the US it was on the “Something New” album, not a major player. Nobody but me ever seemed to own that album. I have the original on vinyl bought at the time of its release. Best and favorite Beatles song… but lots of people dont know it or cant place it- its not Hey Jude-its better than that. When Parlophone released promotional copies of singles to DJs, the song the record company wanted to promote was marked with a big letter A, while the B-side didn’t have any such mark. Interestingly, I’ve seen on other websites that the UK promo copy of “A Hard Day’s Night”/”Things We Said Today” had BOTH sides marked with an A. This suggests to me that you could classify AHDN/TWST as a double-A-side single. Does anyone else have more info on this? That seems to be a mistake by the person who labeled the record. Yes. I remember a double-sided Beatles single – consisting of SFF on one side, We Can Work it Out on the other. No, We Can Work It Out and Day Tripper were both A sides. Fine song–great rhythm acoustic guitar by John, including his triple strum at the song’s beginning. I have always wondered if that was John’s idea/touch or Paul or George’s. The Beatles always gave a lot of attention to their songs’ introductions. Anyone notice the similarity of the opening riff to The Stones’ Jumping Jack Flash, or rather the other way around since The Stones song came later? Yeah, they both start off with that fluorish, that triple-strum. I doubt that it was a direct imitation, it’s nothing terribly unique. Wonderful song, oft overlooked imo. Whilst I think PM harmonizing with himself sounds great, on my Beatles fantasy wish-list is a version with Lennon singing harmony (see “The Beatles at the Hollywood Bowl”). George harmonizes on the live versions and does a great job. I actually prefer Georges harmonizing to the studio version. Same thing with the live versions of All My Loving. I’ve just recently found that George and Paul harmonize in live versions of this songs. They do as well for All My Loving, of course, and it’s great. Do you know any other Beatles’ song with this particular live-vocals arrangement? I also prefer the live version of both songs. Wonder why they didn’t do it with Paul and George to begin with? Most of the time they killed this, but the both of them had trouble remembering the words at times and got mixed up. (Philadelphia/Vancouver) It amazes me how they remembered so many of these lyrics it’s extremely difficult when you’re on stage and there’s chaos all around. I feel it is very easy to forget how hard that actually was when they played most of these songs perfect all the time. Once you hear them mess up it makes you appreciate the best version’s even more. There is no similarity here with the Stones’ Jumping Jack Flash.. it’s a completely different intro! Did the hollies rip this off for bus stop or did Paul rip them off? Bus Stop was released two years later, so draw your own conclusions. Both songs sound alike because they are in A minor, but the similarity ends there. I love them both, especially the completely different approaches to harmony. TWST is more melancholy, while Bus Stop sounds sunny even though it never leaves the minor key. The similarity does not in there. Allen Clark’s vocal is also similar especially the way it resolves at the end of the verse “by Sunmer she was mine” compare “then we will remember things we said today” and additionally the rhythm is the same. And the song structure is the same. The Am to Em is the same during the verse. Whatever it’s fine, I like bus stop, but try playing them side by side one time. My college boyfriend and I adored this song. Forty-nine years later, as old married people, we reminisce often about how that song predicted our future together. It may be overlooked by most, but remains our favorite Beatles tune. Laney B, you have great taste. It is our favourite Beatles number as well, for the same reasons. I feel this song is an Important example of mccartney using the actions of a fictional couple as the future as material for his songs. How can this song continue to escape the attention of almost all but the most dedicated of Beatles fans? The melody may be a little flat and the lyrics more wistful than those they wrote at the same time and before, but it’s a perfect example of how by mid-1964 they were breaking away from the She Loves You formula. It stands all by itself as a timeless gem, even if it can’t be called genius. Agreed on the point of beginning to break out of the teenage love song era. A friend of mine built an audio room in his house in the ’70s with very high end equipment (Marantz, Klipch horn speakers, etc.). One afternoon we dropped the needle on this tune, and I can tell you it stunned us all into silence. What jumped off the vinyl that day in full clarity was true magic..the tune IS a gem. It just suddenly hit me that this song is Really great and I can remember buying the new Mono version of Twist and Shout. so how has that happened.? First heard this on 45 via a family members copy as B side to A Hard Days Night and later when I got the album. One of Paul McCartney’s best and most underrated ballads. This is a beautiful song with a great melody and rhythm guitar. The middle-eight on this song is phenomenal — from the abrupt switch at the outset from minor to major, to the chord progression that follows. May have been the early inklings of Paul starting to merge multiple songs into one, which he became quite fond of later on. The middle here is really quite a change from the verses, also possibly inspired by what they did with Ticket to Ride. I think the person at Parlophone, who labeled the single, made mistakes more often. i have a single that has the same lable Things we said today on both sides. so also on the side A Hard Day’s Night. I guess this is a collectors item? ‘Things We Said Today’ is one of a handful of early Beatles work that told me they were truly great talents. I still don’t like ‘I want to Hold Your Hand’ nor ‘She Loves You’ much. McCarney used enjambment in it and and even had the chorus continue its sentence into the final verse with ‘..and that’s enough to make you mine girl…’ I don’t think that was ever done before. A remarkable song using a lot of minor chords. My favorite Beatle love song…The Aminor verses and the Amajor middle 8 is a joy to play and sing to. Yes this song is underrated, on a B-side. A world class classic. No other band had such strong writing skills. Ever. where is the official or original lyrics? but in all the lyrics that i found on internet appears the word “LUCK” instead. I’ve always heard “love” too, but the few lyric sites I just checked do say “luck.” I suppose “luck” makes (slightly?) more sense, because of course “love is love.” That said, “luck” seems a weaker and cheaper lyric, not as poetic, I guess. And though we may be blind, love is here to stay. Thanks, Ahhh Girl! Such a beautiful song. Would’ve been sad to think I had it wrong all these years! hasn’t the resemblance to the “an alarc’h/three ravens” tune ever struck anyone else?! i was singing the chorus to “an alarc’h” this morning and my husband started singing “the things we said today” and now we can’t stop wondering about whether there is an influence – conscious or not. the funny thing is i’d never really noticed the beatles song before, but now i am totally in love with it. the lyrics are really well written and sound almost surprisingly mature for that early on in the beatles’ career. What really makes this song is that Bb chord both on the verse and the middle-eight…it wouldn’t have been the same without it! My younger brother got this album(Something Else) as a trade 1966 and it was the first Beatles album I was ever exposed to. Being an elder brother I had never followed their work as albums back then were expensive and my buddies were into the Stones.It was beat up and Things we said Today cut had a bad scratch in the first reprise which caused a line to drop out.”Someday when we’re dreaming (scratch)-then we will remember things we said today.